Vision 2020, in conjunction with The Carbon Farm & The Living Classroom has taken a three month lease on part of The Fader Building, including the two northerly windows. The purpose is to create wonderful display space for the many great things which are going on in our community, and for our many natural attributes, and to do some justice to this wonderful old building. Our thanks to the owners of the Emporium for the opportunity. The first exhibit is in the window – a marvelous contemporary artwork by one of the artists from “An Artist, Farmer & Scientist Walk into a Bar” project, Georgina Pollard. 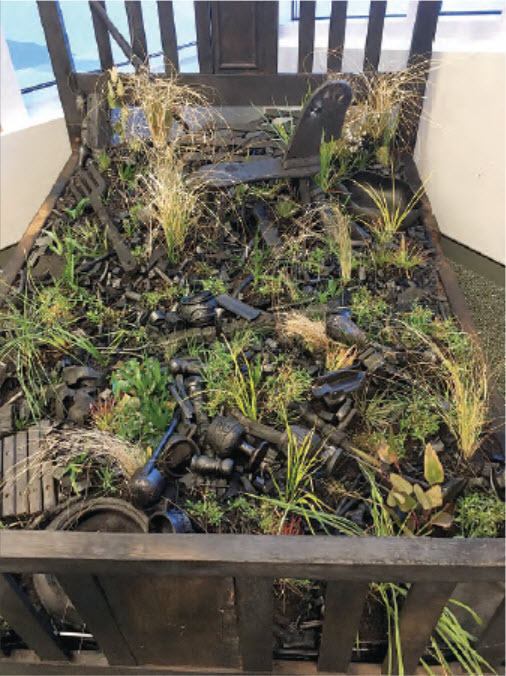 The work, titled “The Long Sleep” was commissioned for the annual Biochar conference by the Biochar for Sustainable Soils project. This is a donation to the communities of Bingara & the Gwydir Shire, and our thanks to the Biochar initiative. “The Long Sleep” will in time find a permanent home at The Living Classroom” where it will accompany the many other works of art which will result from the project. Georgie, Adam Blakester and Dr Ruy Anaya de la Rosa (from Biochar for Sustainable Soils) were all very active participants in the two days titled “Carbon Science: Carbon Culture” held at The Living Classroom in June. 50 adults and 75 schoolchildren had an exciting, interactive exposure to carbon and its many attributes. The commitment of all participants to the Artist, Farmer, Scientist project is extraordinary and the community engagement and resulting works of art will add immeasurably to the rich fabric of “our place”. Over the next few weeks we will be pulling together the rest of the display. We have enough material for it to be a space with a “wow” factor. It will include a large screen television screening stories and footage which cannot be seen elsewhere. Vision 2020 will focus on the future. We now have the “Wider Gwydir 2030” document which represents 2 years of work and of your ideas – and we will be showcasing strategies so that we can picture what the future might look like. For The Carbon Farm & The Living Classroom this is an opportunity to bring to the main street some of the marvelous things which are happening on those facilities. We welcome input from members of the community both in terms of content & display.